451bg.org is a project of the Army Air Corps Library and Museum. Volunteers are transcribing servicemen names and their awards from General Orders that we are publishing on this website for enthusiasts, families and researchers of genealogy and World War II history. The names on this honor roll of men assigned to the 451st Bombardment Group is not a complete list of all who served with the 451st, however, we are attempting to locate as many documents that have survived as possible. Sources of material include the US National Archives, Air Force Historical Research Agency and the records donated by individual servicemen and their families. We hope you will find this information useful and enjoyable. We are accepting volunteers help in this very large World War II project as we preserve this history and honor service. The 451st BG and their B-24's moved to the Mediterranean theater, November 1943-January 1944. They were based in Italy and assigned to the 15th Air Force. Flew strategic missions to oil refineries, aircraft factories, airfields, marshalling yards and other industrial targets. They were commended three times being awarded a Distinguished Unit Citation (DUC) for missions to Regensburg 22 February 1944, Ploesti 5 April 1944 and Vienna 23 August 1944. They would be based in Italy through VE Day. 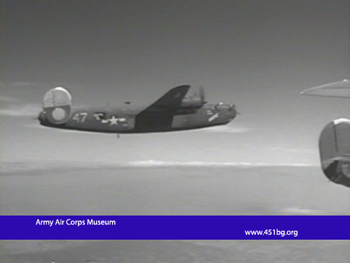 Archival Combat Film Footage DVD of the 451st BG.